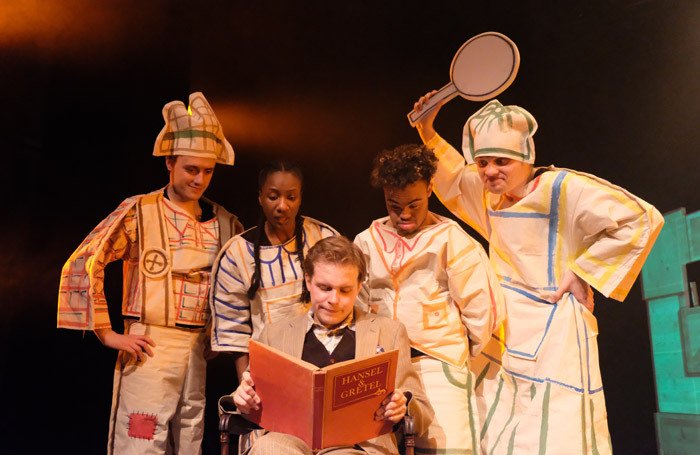 The Birmingham Hippodrome’s first in-house production – a collaboration with Open Theatre Company and inventive theatre-makers Metro-Boulot-Dodo – sees a cast of professional learning disabled actors conjure a version of Hansel and Gretel. Nicky Priest’s haughty, fussy storyteller guides the evening, and is all about keeping to the script, trying – ineffectually – to keep his actors’ alterations to the story to a minimum. You naturally root for the underdogs, though writer-director Esther Simpson gives the vast majority of the lines to Priest, while the actors are mostly dealt one-line catchphrases to endlessly call back on. Rishard Beckett’s hilarious Hansel (“I’m well smart”) is particularly underused. Vicki Taylor as a silent but stubborn interrupting duck who speaks through pre-prepared placards and waddles with consummate swagger claims she’s ‘the hero’ of the play, and she probably is, raising the biggest laughs. There seems an opening here to explore the creative agency that leaning disabled artists are, or aren’t, afforded. Who gets to tell stories, and who gets to be the hero? The issue is gestured towards, but the ‘twists’ which inflect this version of Hansel and Gretel amount to little more than the addition of a secondary character here and there – the plot remains intact, and the abrupt, self-confessedly ‘weird’ ending leaves us asking what it was all heading towards. It’s brilliant to see an excellent company take up space at a major commercial theatre, but it can’t help feeling like something of a missed opportunity.